"Sleep when you're dead!" Our Western lifestyle promotes a high-speed, caffeine-fueled schedule filled to the brim with activity. Rest can seem like a waste of time. In our world of high stress, many of us run in a constant state of fight-or-flight or the “Zombie Apocalypse Zone.” We're on edge, ramped up and ready to clobber the undead at the first sight of a threat. Our levels of the stress hormone cortisol are high, a bad thing because high cortisol has been linked to high blood pressure, weight gain, insomnia, muscle tension, joint pain, fatigue, depression, and heart disease. Although we need cortisol to navigate high-pressure situations, too much of it often means poor health. The good news is that yoga can help us lower stress. The even better news is that Restorative Yoga is the best type of yoga to do it. Restorative Yoga is when you take traditional yoga poses and prop them up. Poses are practiced with the help of props so they can be held for longer periods of time. A student can hold a pose from 2-10 minutes with the right mini fortress of props supporting them. In Restorative Yoga, props help relieve the strain on our muscles so we can focus more on relaxation. Think of the use of props in our yoga practice as a metaphor for life: we do better with support. Forget about zombie-killing swords, yoga props are what you really need. I've worked with students who have had a hard time with restorative poses because they weren't convinced they were doing anything for their bodies. The fact is we need our nervous system to chill out if we're going to stay healthy. Coupled with breathing techniques Restorative Yoga allows us to turn on the part of our brain that helps us relax, calm down, concentrate, and be more attentive. The end result is a better mood, better sleep, better pain management and better overall health. Kim specializes in demystifying yoga. 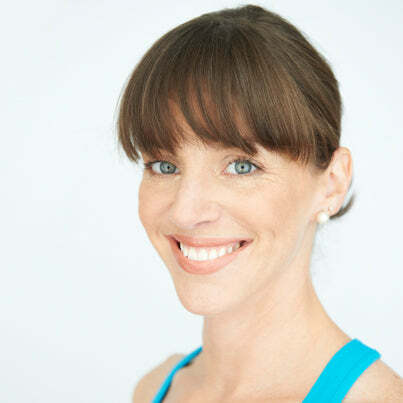 Her multi-disciplinary approach to yoga therapy helps her clients manage chronic pain, stress, and mobility issues. The result is a huge improvement in their quality of life which includes getting back to doing the things they love.